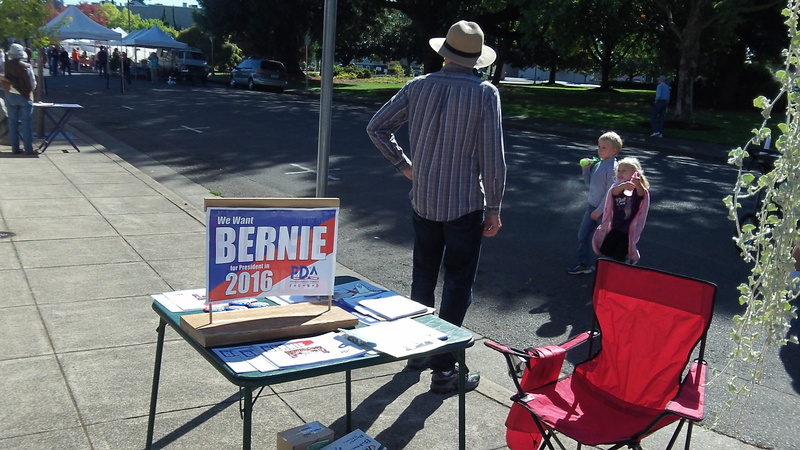 Waiting for voters away from the Albany Farmers Market on Saturday. 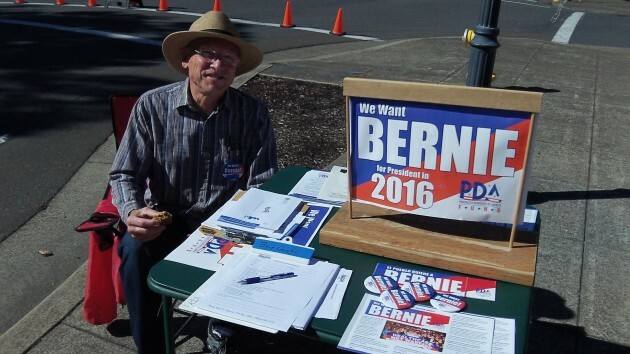 What makes Democrats pull for Bernie? I think the main reason is that he’s not Hillary. He comes across as a sincere if radical do-gooder rather than a calculating politician claiming to be entitled to succeed Obama. It may also be his program that excites followers. His “12-point plan” appeals to self-declared progressives because it enlarges the role of government in handing out benefits. It is also sufficiently vague to hide the potentially destructive effects — to liberty and the economy — his policies would entail. For instance: “Develop new economic models to support workers in the United States instead of giving tax breaks to corporations which ship jobs to low-wage countries overseas.” Three cheers, sure, but what would such a new model look like? Protective tariffs? Controls on imports and exports? A government office to plan who produces what, and where, setting wages to “support workers” and determining what things should cost? A new model like the one in Venezuela? Or Cuba, maybe? Another of his 12 points: “Break up the big banks.” He complains that six big banks underwrite more than half the mortgages and issue two-thirds of all credit cards. So? What would be Bernie’s limit for how many mortgages and credit cards banks are permitted to issue with Sanders in charge? Bernie is not above repeating the canard that women “make 78 percent of what male counterparts make,” and he wants to “provide” equal pay. The law has required equal pay for equal work for a long time, and practice has followed suit. Obviously not all people get paid the same, and the reason is that jobs differ, as do many other factors. If strict enforcement of the law has not resulted in everybody being paid the same, what would Bernie do? Appoint a federal Pay Board to determine what every job pays and overseeing what every individual makes? Sanders supporter Rowland Gaal at his post. Sounds appealing. Tax someone else and give me free stuff. Who wouldn’t vote for that (other than greedy folks and corporations who don’t want to give me their money)?